The immunoassay—a mainstay of life sciences and clinical diagnostic laboratories—detects and quantifies proteins and other kinds of molecules in complex samples, usually through the use of antibodies. Although immunoassays offer specificity, convenience, and economy, they tend to disappoint if multiple analytes need to be measured simultaneously. Expedients exist, but they typically involve parallel workflows, which consume more sample or require specialized equipment, such as microfluidic devices. Instead of running multiple singleplex immunoassays—in parallel or, worse, in sequence—one may run a multiplex immunoassay. When the multiplex option is taken, the usual antibody-coated well may be replaced with antibody-coated elements such as beads or microwells. Many configurations and antibody/reagent combinations are being developed. Which might work for you? To find out, read the advice from our multiplex immunoassay experts. GEN: What is the biggest consideration researchers have when deciding between multiplex immunoassays and standard assays? Dr. Pregibon: For many researchers, the decision to multiplex is driven by the desire to obtain a breadth of biological data from a limited sample volume. In addition, as the field better understands how proteomics, genomics, and epigenetics can be used together to describe complex biological states both in vitro and in vivo, the assessment of several biomarkers across many types of targets can provide a more comprehensive snapshot of a disease and accelerate research outcomes. With only 50 µL of serum, it is possible for scientists to use Abcam’s FirePlex® platform to profile 10–20 proteins or 20–50 microRNAs, and do this over hundreds of samples. Dr. Tan: Prior to embarking on an effort to develop or validate multiplex biomarker assays, one should critically evaluate whether candidate assays suffice to enable one to go beyond the conventional “one target, one drug” approach. ‘‘Composite profiling’’ may not be the only rationalization for using multiplex assays. The justification should be driven by the need to probe biological networks, dissect pathways, and monitor physiological and pathological states. Oftentimes, this key consideration is influenced by the complexity of developing the multiplex assays (such as biological expression levels) and the fear of added expense to validate them. Ms. Johnson: I think this can vary by research project. If sensitivity is the most important factor, or if only one or two proteins need to be measured, then a standard assay is an excellent solution, like Bio-Techne’s Quantikine® ELISA kits. However, if sample is precious and/or a researcher is in the discovery stage of a project, then multiplex immunoassays can be a better choice. For up to four analytes, Simple Plex™ Assays afford researchers the best of both worlds: multianalyte measurement with single-analyte performance. Dr. Wild: Of course, the price is an important aspect and if only a few analytes need to be examined, standard assays would likely be the first choice. The analysis of several analytes in parallel within a single assay, however, reduces handling steps and thereby improves the robustness and comparability of results. Additionally, usually smaller amounts of starting material are required, making a multiplex approach very attractive for rare samples. In my point of view, proving the absence of analytes can also provide important information. In some cases, one might even detect something unexpected just by looking for more than the usual suspects. Dr. Mao: From my point of view, the cost, sample volume, availability of analytes, and target detection sensitivity are the four most important aspects to consider. For biomarker discovery, researchers often prefer “big nets” to find meaningful targets. We address this need by offering the world’s largest sandwich-based, quantitative antibody array, capable of measuring over a thousand human proteins in one experiment, at a cost of around a dollar per target. The cost may be reduced even further by adopting the single-antibody, direct antigen-labeling approach. This method doesn’t permit quantitative output, but does give relative signal changes. Dr. Chimento: The biggest considerations when deciding between the multiplex and standard assays are availability of suitable multiplex and platform equipment to run the assay along with the availability of the test samples. Developing a singleplex or standard assay is straightforward, as buffers and other reagents can be easily designed to detect a single protein target. Multiplex assays have an inherently longer development time as the optimization issues are compounded. These frequently make use of a single multianalyte sample in a specific diluent, which may not be optimal for all the components in the multiplex. Multiplex assays, however, may be critically important when the test samples are limiting, allowing researchers to collect required data on an otherwise limiting sample. GEN: What are some of the main challenges companies face when developing multiplex immunoassays? Dr. Pregibon: The development of multiplex immunoassays is predominantly plagued by unwanted interactions and interference between antibodies, targets, off-targets, matrices, and substrates. A great immunoassay starts with great antibodies and ends with validation across relevant biological matrices to combat these issues. Abcam’s monoclonal rabbit antibodies are high-affinity, high-specificity binders, and our FirePlex immunoassays, which are built on bio-inert substrates, are validated across several biological matrices to ensure experimental compatibility. Dr. Tan: The entire scaffold of antibody screening for the development of multiplex immunoassays depends critically on the pairing of high-quality capture and detection antibodies. The main challenge of working with these reagents is dealing with variability, such as between-lot and between-vendor variability. This can be extremely difficult to delineate empirically during the assay development process, in which the variability in these reagents is buried deep and magnified in a multiplex setting. We take great care to minimize the effects of this variability in our assays. Managing assay cross-talk is another challenge in developing these assays. Even with top-quality antibodies, nonspecific binding arises when many different antibodies are blended for multiplex testing. We carefully select and screen antibodies in the multiplex environment to choose the best pairs for each particular assay. Ms. Johnson: The biggest challenge is balancing quality vs. quantity. Bio-Techne’s goal is to multiplex as many analytes as possible without sacrificing accuracy and precision within the assay. While developing our Human XL Cytokine Discovery Luminex® Performance Assay, we spent a great deal of time optimizing assay diluents. We have a large supply of antibodies at our disposal, but the raw ingredient requirements for each analyte can be vastly different. Inevitably, analytes must be left out because they don’t meet our strict performance specifications. Researchers should be wary of large multiplex assays that promise single-analyte assay performance. Dr. Wild: Finding the right capture reagents (such as antibodies) is important for every assay, but it becomes crucial for multiplex assays. Of course, the antibody must be specific for its target, but it must also work in the context of a multiplex platform. In addition, unwanted interactions between the antibodies, detection reagents, and analytes should be anticipated. If such interactions are possible, they must be subject to detection. Quality control of the components as well as for the complete assay are very important and must be carefully developed in parallel to the assay itself. Availability of high-quality antibodies: Analyte detection by sandwich antibody pairs must be validated by both calibration curves and relevant biological samples. Cross-reactivity between antibodies: For sandwich-based immunoassays, the combinations of paired antibodies within an array panel can occasionally cross-react. Before assembling the panel, rigorous cross-reactivity testing must be performed for each antibody pair with every other antibody pair. The larger the panel, the more laborious array development becomes. The matrix effect: Unlike singleplex assays, the accuracy of multiplex systems may be adversely affected by the mixture of multiple antibodies and calibration standards. Reagent lot-to-lot variability and kit reproducibility. Dr. Chimento: In the multiplex assay, the reagents must work together correctly on the same sample matrix, and they must function on the desired platform. A common approach in developing a multiplex assay is to purchase or license commercially available reagents. The challenge comes because the reagents were not specifically designed to function together or specifically on the sample type, or for the platform being used by the researchers. The outcome is a multiplex with specific gaps for the missing reagents. The researchers may then need to develop “fit for purpose” reagents to fill the gaps in the multiplex assay. GEN: Have there been recent scientific discoveries and advances that made a significant impact on the development of multiplex immunoassays? Dr. Pregibon: To meet the diverse needs of drug discovery and biomarker development, immunoassays have seen advances in sensitivity for single proteins, assay simplification for high-throughput automation, and the use of both immunoassays and nucleic acid assays, as well as spatial profiling. Platforms capable of profiling both proteins and nucleic acids, including NanoString’s Vantage, Bio-Techne’s Luminex, and Abcam’s FirePlex, are finding increased use in research and clinical laboratories. 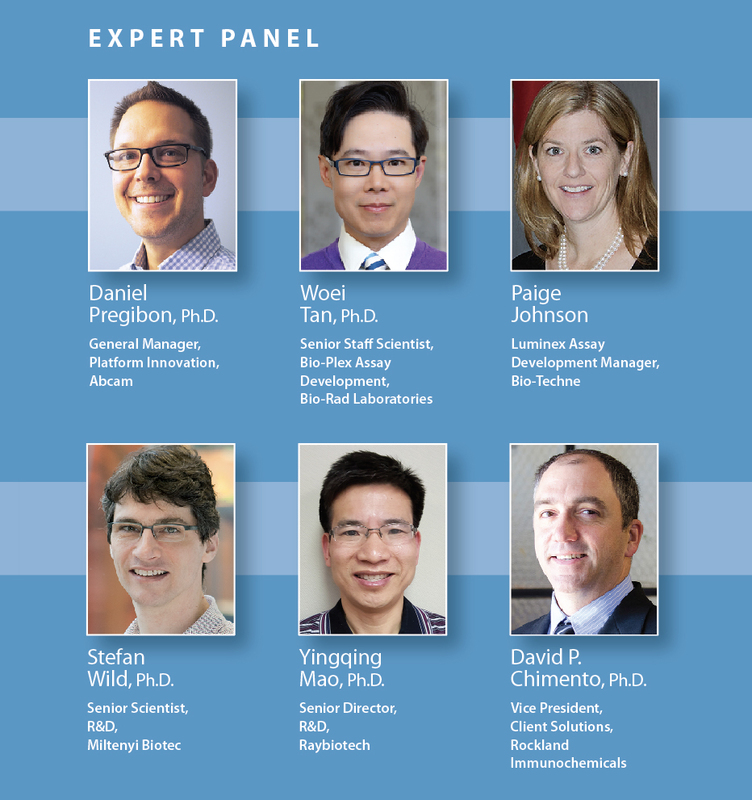 Dr. Tan: The key sectors that have made a significant impact on the development of multiplex immunoassays are data science, biology, and instrumentation. The data science or bioinformatics sector is driven by the demand for big data integration with expert knowledge–driven approaches to develop biologically relevant assays and to better assess the complexity of multifactorial diseases such as cancer, stroke, and diabetes mellitus. The biology sector is fueled by biomarker discovery, drug development, and the emerging demands for multiplex point-of-care testing. The instrumentation sector is driven by the demand for automation and improvement in detection capability of low-abundance targets. Ms. Johnson: The advances made over the past decade are allowing science to move at a much faster pace. Our customers’ priorities and projects can change quickly, so we need to be agile in our ability to deliver the multiplex assays they need. This has led to a shift toward a developmental pipeline that is more responsive (customer request) than preplanned (literature research). We often have customers that are happy with our Luminex® Performance Assays but want additional analytes, customized assay specifications, etc. Our assay development expertise and reagent inventory have allowed us to respond to customer needs. Dr. Wild: The development of multiplex assays that can be run on standard equipment such as flow cytometers expands the range of applications of multiplex assays. Efforts in improving antibody quality and standardized production improves the reliability and comparability of results. In addition, we expect multiplex assays to speed up discoveries in new research topics such as extracellular vesicles (exosomes). Dr. Mao: Currently, less than 10% of the human proteome can be measured in a quantitative manner. One of the limiting factors is the availability of high-quality antibodies. To overcome this bottleneck, small synthetic molecules that have antibody-like functionality are garnering more attention, including DNA aptamers, antibody mimics, and protein scaffolds. 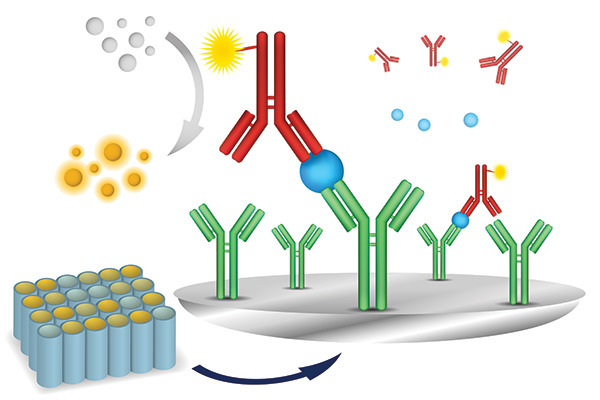 Antibody colocalization microarray technology, wherein individual detection antibodies are printed directly atop their corresponding capture antibodies, has been explored as a solution for cross-reactivity among antibodies. Finally, DNA amplification–based proximity ligation (PLA) technology has been employed to increase immunoassay detection sensitivity. Dr. Chimento: Technological developments within both ancillary reagents and platforms have made a major impact on multiplex assays. Robust antibody reagents have been around for some time. Now they may be combined with (1) highly specific fluorochrome or dye-based reporters (which may be used with antibodies and beads), (2) exceptional microfluidics, and (3) outstanding detection sensors. These reporter and detection system combinations have made it possible to create not only a multiplex assay but even a single-well multiplex assay, where multiple reporters are delivering data simultaneously, reducing costs and saving time.